From the image displayed by Public Arts Fund, we can expect a modified, vintage Volkswagen Microbus transformed into a work of food art, serving free hot dogs to visitors all summer. One of this city’s “most iconic street foods” served from the “bright yellow, overstuffed food truck,” is meant to encourage audiences to reconsider the relationship between capitalism and consumption in today’s culture ~ “while the act of eating, according to Wurm, can be considered an additive sculptural process in its own right.” Are you listening, Joey & Miki? The Australian-based artist, Erwin Wurm, is best known for his plumped-up, elaborated sculptures of everyday thoughts and items, like the Melting House Series, the Fat Car Series, Bad Thoughts, Obedience/Disobedience and The Artist Who Swallowed The World (2006) + many more. 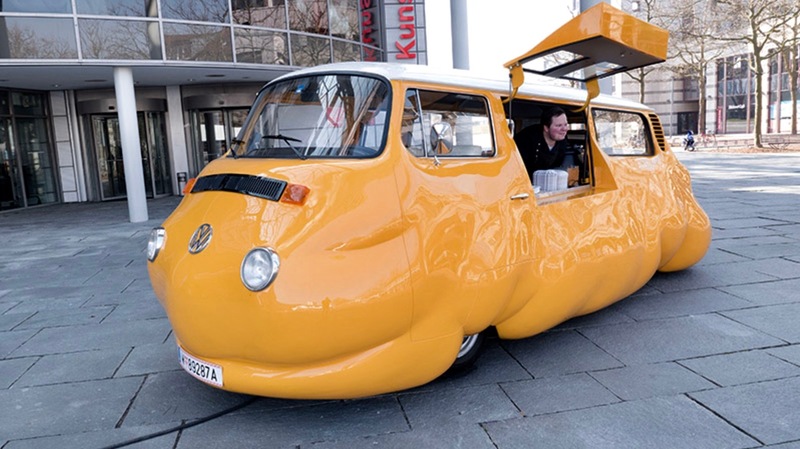 Curated by Public Art Fund Associate Curator, Daniel S. Palmer, Erwin Wurm: Hot Dog Bus is truly an interactive installation, that will be on view on weekends, along Brooklyn Bridge Park’s 1.3 miles of waterfront. This is the first in a series of three summer exhibitions presented by Public Art Fund, with Tauba Auerback: Flow Separation opening on July 1st and B. Wurtz: Kitchen Trees opening August 7. Yinka Shonibare MBE: Wind Sculpture (SG), also presented by Public Art Fund, will continue to be on view at Doris C. Freedman Plaza to mid-October. 2018.